In the end of May Ras Sheehama one of the most important musicians Namibias will celebrate his first gig in Germany at the Africa Festival in Würzburg. Sheehama's music shows a tremendous feeling for the good and bad sides of life, which he brought back to his homeland Namibia from his exile. His new CD "Travelling" was introduced in November 1998 in Namibia for the first time and will be released in Europe very soon. Ras Sheehama was born in 1966 in the north by Namibia (at that time still South-West-Africa), the political pro SWAPO adjustment of his father forced him into exile in 1979 to Angola and Zambia. Here he developed his love for the music and taught himself to play the guitar. In Zambia for the first time he got in contact with the Rastafari and Reggae culture. 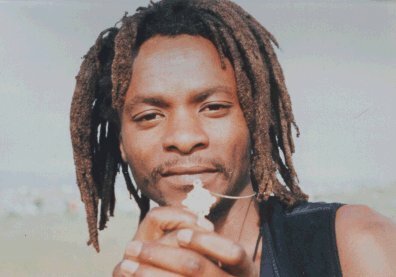 During his time at a highschool in Lagos/Nigeria (84-88) he played in several Reggaebands and so could bring huge experience to Namibia, when he came back in 1990 for the first free elections in his home country. Nowadays in Namibia Ras Sheehama is the most important and most popular musician of the country. Since 1990 he released several vinyls and cassettes that are only available in Namibia and South Africa. From these tapes several hits were successful continously in Namibia. Sheehama was able to win several national prices, among others one for the title "Traveling on the wildly side", which is now titeltrack on his first CD "Travelling"". This CD has been recorded in the "Digitally Cupboard Studios" in Johannesburg (South Africa) together with the new CD of the Jamaican roots star Don Carlos that hasn't been released yet. The recording band was included famous musicians of the well-known South African bands "Stimela", "Bayete" and of Lucky Dube's band. A great album was made that shows the hugh musical quantities of Ras Sheehama and the band. He is a outstanding singer, who understands to show in its texts both African joy of life and criticism of the political and social situation of past and future. As in his life Rastafari is always a central point in his songs without becoming pathetic at all. Most important musician in Ras Sheehama's band is the Swedish guitarist Joel Klein, who also produced the new CD together with Ras. Joel was described to me as the driving motor of the band and that also can be heard on the new CD: The guitar isn't dominating the sound as in most african reggae-productions, it truely does fit smoothfully in the sound and completes the whole concept of Ras Sheehama musical style. Short clean Gitarrensolos rounds the pieces really beautifully off. At all the whole production is very good and absolutely audible. In the end of May and the beginning of June Ras Sheehama and Don Carlos will be on tour together in Europe. Highlight will be the appearance of Ras Sheehama with his band at the Africa Festival in Würzburg. The band will be the same as the one that can also be heard on the CD. Ras Sheehama will play on Sunday afternoon (30.5.99) outside on the open stage. The dates for the European tour together with Don Carlos are not yet confirmed.